Astronomers have always really liked classifying the things we discover. Stars were named (“Oh Be A Fine Girl, Kiss Me!”… also in song form?) by their spectral lines before we understood that they were powered by fusion and could be sorted based on mass alone. We came up with all kinds of different names for types of AGN and later figured out that some are actually the same objects, just viewed from different angles. In the spirit of enthusiastic naming, astronomers have started trying to understand how to organize classes of exoplanets based on their physical characteristics. As it has turned out over the last ten years, exoplanets are considerably more complicated to classify than stars. The evolution of star is based (almost) exclusively on how massive it is at birth. The mass governs how bright it is, its temperature, its spectrum, its lifetime, and how it evolves off the main sequence. Proposed classification scheme from Fortney et al. 2008, dividing hot Jupiters into pM and pL classes based on irradiation levels. But observations of planets show that planets are a more diverse crowd. Back in 2008, when almost all of the discovered planets were irradiated hot Jupiters, a paper by Fortney et al. attempted to classify planets into most-highly-irradiated (pM) and less-highly-irradiated (pL). The difference, they predicted, is that the most-highly-irradiated planets are hot enough to have species like TiO and VO in their atmospheres. These species are very efficient absorbers of optical light and would warm the upper atmospheres of these objects causing a “temperature inversion” (a temperature inversion means that the temperature increases instead of decreases as you move higher up in the atmosphere—Earth’s atmosphere actually has a temperature inversion in the stratosphere because of its ozone layer!). Less-irradiated planets would be cold enough that TiO and VO condense into particles, removing them as optical absorbers. The hottest hot Jupiters were thus predicted to have temperature inversions; the cooler hot Jupiters should not. However, more data has showed that the picture is more complicated; several counterexamples to this prediction have now been observed. That’s where this new paper comes in. Madhusudan suggests that in addition to differences in irradiation, these Jupiter-sized planets might actually have different compositions. Two of the most abundant elements in stars and giant planets (after H and He) are carbon and oxygen. In the Sun, the ratio of carbon to oxygen is 0.54 (i.e. about half as many carbon atoms as oxygen atoms). If the chemistry in a hot Jupiter is significantly different than solar composition—say the planet’s atmosphere had more carbon than oxygen (a C/O ratio greater than 1)—the molecules that form would be very different. In a high carbon planet, instead of forming a lot of water vapor (H2O) in the atmosphere, you would form a lot more methane (CH4). This would make the planet’s spectrum look completely different! As it turns out, a carbon-rich planet, even when highly irradiated, would also have significantly less TiO and VO—these optical absorber that may give a planet a temperature inversion—so, depending on the chemistry, we might not see a temperature inversion in all hot hot Jupiters. Proposed new classification scheme. On the left, the major molecules that would form in each planetary class are shown. The O-rich planets are dominated by water vapor. C-rich planets have less water, more methane, and very little of the optical absorbers TiO and VO. On the right, the observed exoplanets with measurements of the C/O ratio. Previous measurements are shown in blue; estimates from this paper are shown in red. Madhusudan suggests that we include this compositional change—the C/O ratio—as another axis for classifying planets. 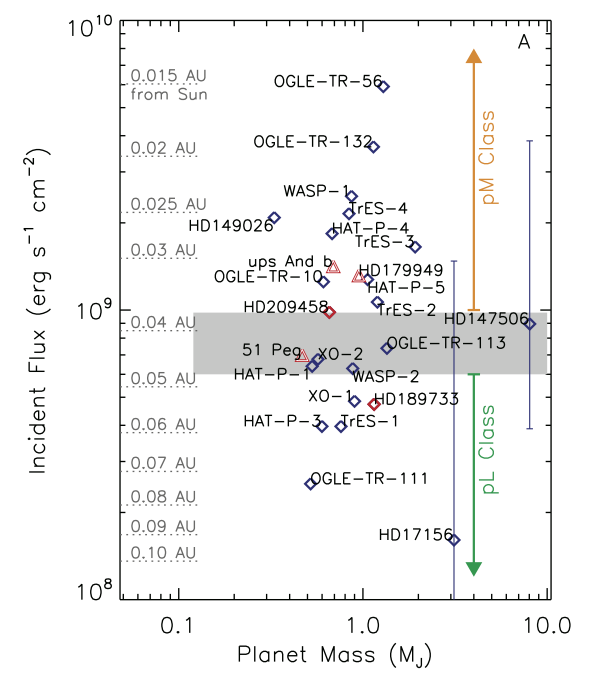 He divides planets into 4 classes: O1 and O2 (mapping to the pM and pL of Fortney et al. 2008) and 2 new classes, C1 and C2, corresponding to hotter and colder carbon-rich planets. The one problem? It’s a really hard value to measure! Exoplanets are still super challenging to characterize, and it’s very hard to even tell a simple chemical ratio in their atmospheres. Only time and hard work by both modelers and observers will tell us whether hot Jupiters can really be divided into these 4 clean categories.